Fetal mouse calvarias were cultured in a medium containing fetal calf serum, 1, 25 (OH)2D3 and parathyroid hormone in 5% CO2 incubator at 37°C for 5 days. The calvarias were then fixed in a buffered paraformaldehyde solution and the periostea were removed, A polyclonal antibody against transforming growth factor-β (TGF-β) and a second antibody labeled with fluorescein isothiocyanate were used to detect TGF-β. 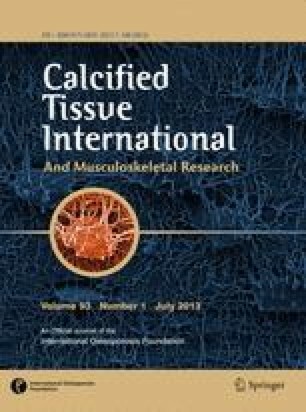 As a result, a specific staining was observed only in the shielding zone covered by osteoclasts in the bone resorption lacunae and in the extracellular matrix adjacent to the osteoclasts. These findings suggested the local delivery and possible activation of TGF-β by osteoclasts in tissue.